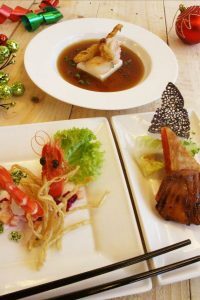 Get set to indulge in merry holiday feastings as Zuan Yuan Chinese Restaurant pulls out all the stops to present a sleigh of tantalising set menus. The prix-fixe menus, ranging from six to eight courses feature a perfect symphony of flavours guaranteed to impress the palate and belly! It is always about good food, good celebrations and good spirits at Zuan Yuan Chinese Restaurant of One World Hotel Petaling Jaya. Discover a deluge of mouth-watering selections like Vietnamese Soft Shell Crab and Fruit Salad, Pan Fried Beef Fillet with Spicy Apple Sauce, Double Boiled Fish Soup with Monkey Head Mushroom, Conpoy, Fish Maw and Snow Lotus Seed, Braised Homemade Bean Curd with Sliced Jade Abalone and Assorted Mushroom, Steamed Dragon Garoupa Fish Fillet with Eggplant and X.O. Sauce, Japanese Claypot Rice with Seafood and Chilled Papaya with Sago, Milk and Vanilla Ice – Cream. The set menus are priced at RM118.00nett, RM158.00nett and RM188.00nett per person with a minimum order for two persons. It is available for lunch (12.00 noon to 2.30pm) and dinner (6.30pm to 10.30pm) for a limited time only. A favourite spot for business lunches and family dinners, Zuan Yuan is also popular for its spread of handmade dim sum. For more information or reservation enquiries, please call 603 7681 1159 or email zuanyuan@oneworldhotel.com.my.